Insect activities can be especially fun learning activities for kids during the summer. Of course, ladybug activities are often appropriate at a number of times during the year. 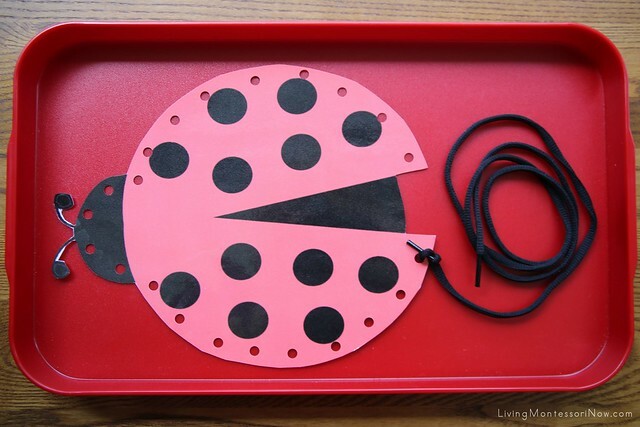 Today, I want to share ideas for Montessori-inspired ladybug activities using some wonderful free printables I found online. The hands-on activities in this post are for preschoolers through first graders. You'll find many more activities for preschoolers through first graders throughout the year along with presentation ideas in my previous posts at PreK + K Sharing. You'll also find ideas for using free printables to create activity trays here: How to Use Printables to Create Montessori-Inspired Activities. Disclosure: This post contains Montessori Services affiliate links at no cost to you. For the ladybug lacing, I printed, laminated, and cut out the Ladybug Lacing Card from Confessions of a Homeschooler. I used a regular hole puncher to make the holes and one of my son's old skating laces for the lace, although you could use any type of long lace or even yarn with the end sealed. For the tray, I used a large plastic tray from Montessori Services. 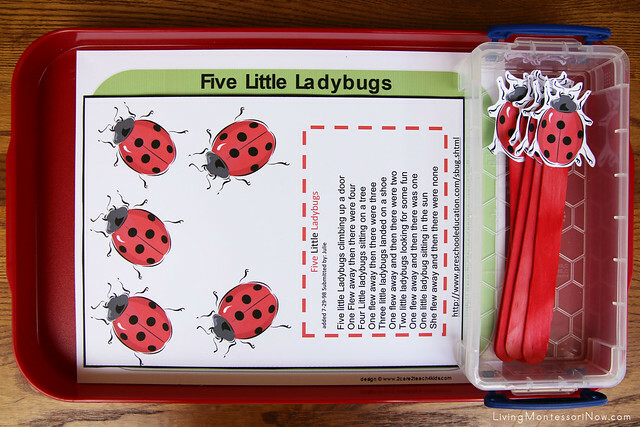 The ladybug life-cycle activity uses a Ladybug Life Cycle Chart from Montessori Print Shop.The free printable also includes 3-part cards and more charts. I made this ladybug life-cycle activity for young preschoolers, so I just printed out two copies of the colored chart and cut out the pictures from one of the charts to match with the pictures on the chart. For the tray, I just used an inexpensive wooden tray from a hobby store. Safari Ltd. has a Life Cycle of a Ladybug material that would be perfect to use with this, but it isn't essential. I have the Safari Ltd. Insects TOOB, which has a realistic ladybug figure. I used that to add interest, although just the pictures could be used for the matching activity. 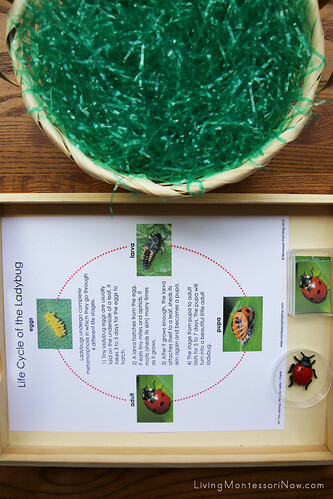 If you have either an adult ladybug figure or the life-cycle ladybug figures, you could create a very simple sensory basket using Easter grass (or fresh grass clippings if you have them). You just need to bury the ladybug or life-cycle ladybug figures in the grass. Your child or students could use a blindfold when searching for the ladybug or ladybug figures if you wish. 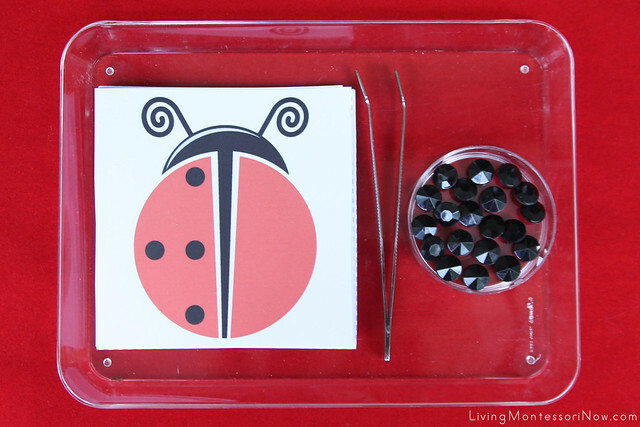 This activity uses the Ladybug Symmetry from Insects Printable Pack at Gift of Curiosity. I used a clear acrylic tray from Montessori Services, tweezers, and black crystals from a hobby store. I got the crystals on sale after Halloween last year. I often reuse materials for other activities throughout the year. While you initially need to find an assortment of trays and materials, later on many Montessori-inspired activities can be prepared from the materials you already have. 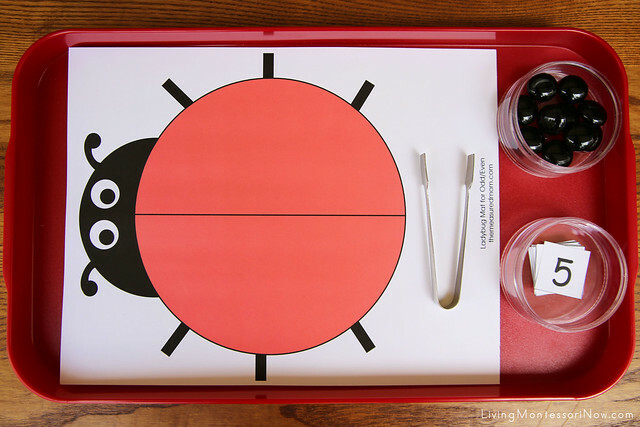 This activity tray uses two free printables: Ladybug Songs and Puppet Sticks from Preschool Printables and Five Little Ladybugs Song from 2Care2Teach4Kids. I used a large plastic tray from Montessori Services. This could be a fun activity used individually or as a small group activity. 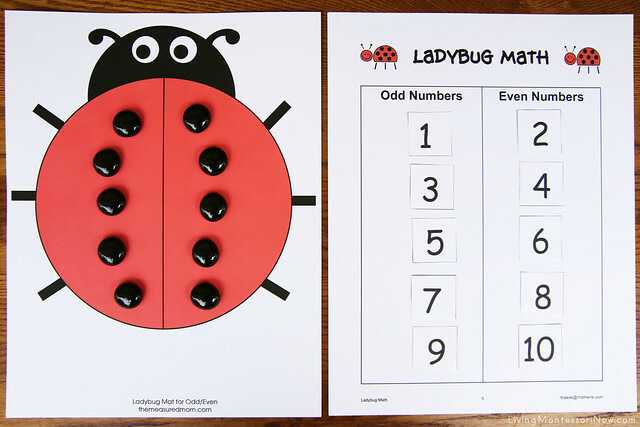 For this odd-and-even math work, I used three free printables: Ladybug Mat for Odd and Even from The Measured Mom, Ladybug Odd and Even Recording Sheet from Mathwire, and Number Cards from the Summer Pack or almost any of the packs from 3 Dinosaurs. Again, I used a large plastic tray along with a sugar tong from Montessori Services and black glass gems to work on practical life skills along with the math activity. This activity would be a great extension to Montessori cards and counters for learning odd and even. If you'd like to make cards and counters with a ladybug theme, be sure to check out the adorable DIY ladybug counters made from glass gems at Trillium Montessori. I just used a variation of Montessori cards and counters with 10 glass gems so that a child could place gems on the ladybug and numbers on the recording sheet. If the child places gems from left to right in pairs of two, it'll show which numbers have an extra gem left over and are odd numbers. 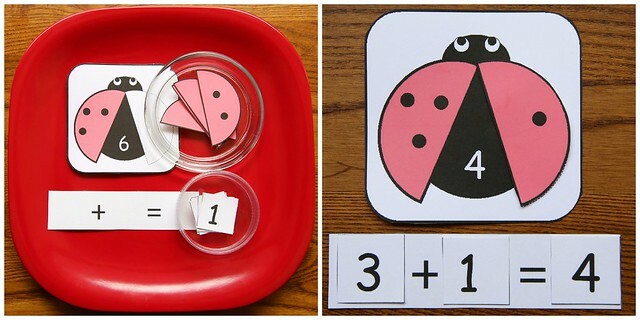 For the ladybug addition, I used Addition Cards for a Ladybug Theme from Making Learning Fun. I also printed out the Ladybug Addition Mat from The Measured Mom and then cut out the addition-equation strip. I reused the numbers from one of the 3 Dinosaurs packs for this activity, too. There are lots of different addition equations available at Making Learning Fun, so just choose the ones that are best for your child or students. 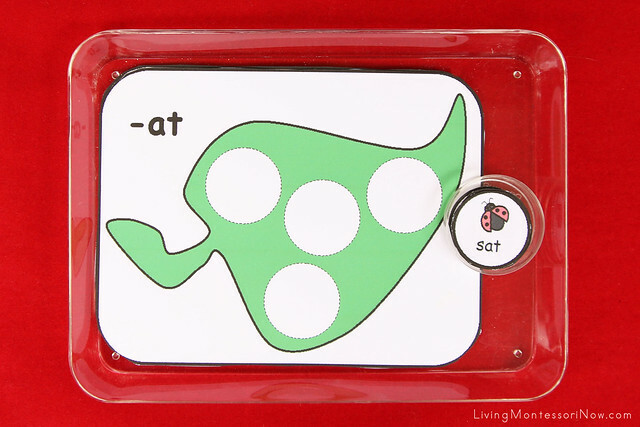 The ladybug word-family phonics activity uses the free printable Word Family Activity for a Ladybug Theme from Making Learning Fun. There are printables for a number of word families, although I just printed out the "at" and "an" word families. You can use whichever (and as many) word families as your child or students are ready for. 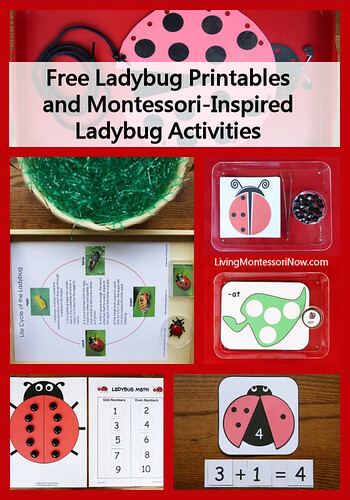 Go to my post at Living Montessori Now for links to more ladybug freebies from around the blogosphere: Free Ladybug Printables and Montessori-Inspired Ladybug Activities. 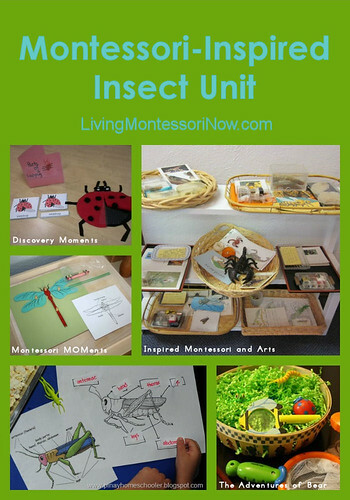 For more Montessori-inspired insect activities, see my Montessori-Inspired Insect Unit. Deb Chitwood is a certified Montessori teacher with a master’s degree in Early Childhood Studies from Sheffield Hallam University in Sheffield, England. Deb taught in Montessori schools in Iowa and Arizona before becoming owner/director/teacher of her own Montessori school in South Dakota. Later, she homeschooled her two children through high school. Deb is now a Montessori writer who lives in Colorado Springs with her husband of 38 years and their cat of 12 years. She blogs at Living Montessori Now. Linked to Tuesday Tots, The Mommy Club Resources and Solutions at Milk and Cuddles and Crystal & Co., The Weekly Kid’s Co-op, Hearts for Home Blog Hop, TGIF Linky Party, Preschool Corner, Sharing Saturday, Saturday Show & Tell, Show-and-Share Saturday, The Sunday Showcase, Link & Learn, and Afterschool Express. What a great group of activities that work on so many different skills! I'm featuring this tomorrow at the After School Linky Party. Stop by to check it out and keep those great ideas coming, Deb!! What great activities!! We may try some of these since we love ladybugs. Thank you for sharing at Sharing Saturday! LOVE the addition activity. My oldest is VERY visual and I think that activity would help quite a bit. Thanks for sharing all these ideas! Differentiate With Beads? Yep! And A Freebie! SUMMER SONGS THAT SING AND MOVE! MEET MY FRIENDS: Chateau Meddybemps!